This is a little Korean restaurant that I’ve been wanting to try after passing it by on Bayview Avenue in Thornhill many times. I walked in on a Saturday during lunch hours and was surprised to see that it was a very popular and crowded place! We were lucky enough to get a seat right away, but soon after that, a line started to form and people had to wait for seats. 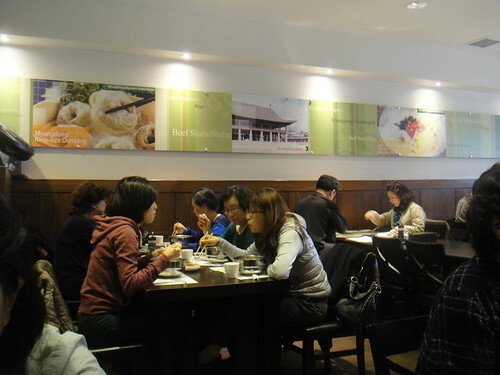 The restaurant is run by Koreans and there are also a lot of Korean guests; I was surrounded by a lot of Korean chatter as I waited for my food. This was a good sign that the food would be authentic! Yum. They don’t have a lot of items on their menu. Either you choose noodles, dumplings, or shabu shabu. Although I really wanted to try their shabu shabu, they only offered the $10.99 lunch menu on weekdays and we didn’t want to order two portions of the weekend shabu shabu set. Instead, we settled on noodles and the king-sized dumplings & rice cakes. 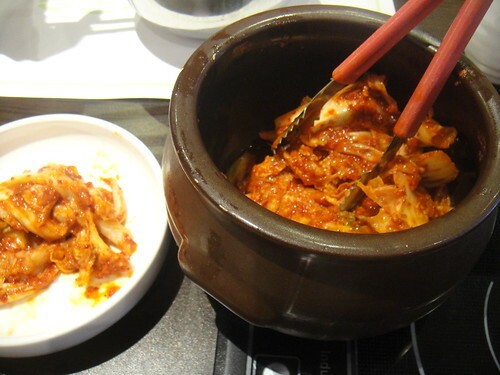 After ordering, they gave us a little pot of kimchi with tongs to use. The kimchi was very yummy! It was in big pieces and it wasn’t too spicy. We ended up finishing the entire pot of kimchi. 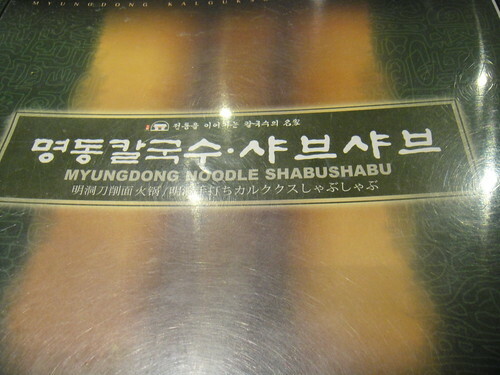 The Myungdong Kalguksoo (knife-cut noodles) were very yummy. The noodles were chewy yet soft and flavoured in the most delicious soup base with lots of onions, green onions, and other vegetables. I slurped up the soup when I was done with the noodles… something that I don’t usually do when I’m eating out at a restaurant. 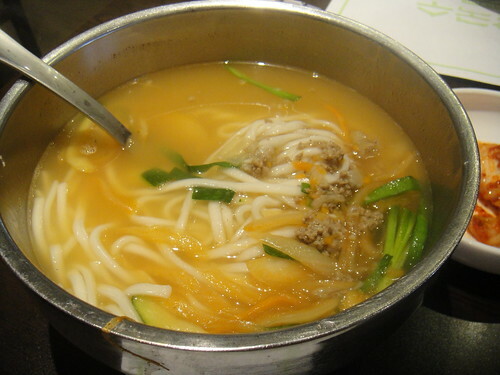 The Myungdong Mandooguk was a bowl of soup with mixed dumplings and rice cakes. The dumplings were huge! 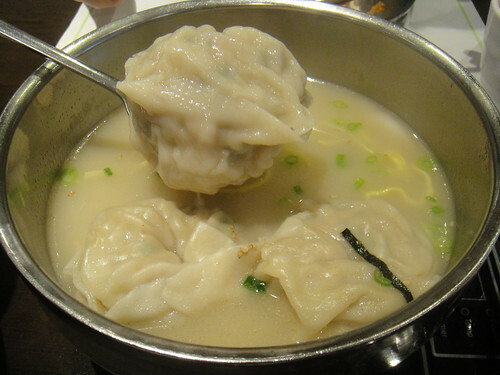 That’s probably why they’re called king-sized dumplings haha. The soft skin is wrapped around the vegetables and minced meat inside. The rice cakes were chewy. The soup base for this was very flavourful. There were also scallions and strips of egg in the broth. I like how they gave us mints when we finished our meal.. probably to ward off our strong kimchi breaths. We finished our food pretty quickly since the line at the front of the restaurant was growing and we didn’t want to take up too much time. Next time I return to this restaurant, I’ll want to try their shabu shabu! This entry was posted in Food and tagged Bayview Avenue, best kimchi in Toronto, big dumplings, dumplings, food blog, foodie, giant Korean dumplings restaurant in Toronto, Kalguksoo, kimchi, knife-cut noodles, Korean cuisine, Korean dumplings in Toronto, Korean restaurants in Toronto, Mandooguk, Myungdong Kalguksoo, Myungdong Mandooguk, Myungdong Noodles Shabu Shabu, restaurant review, Rice cake, Thornhill. Bookmark the permalink.